Tight labour markets and self-service beer: is the productivity slowdown about to reverse? Firms are increasingly investing in automation, substituting capital for labour, as workers become more scarce and costly. We are seeing multiple examples, from automation in food processing to increasingly-common self-service tills. This push for productivity growth is one of the key themes from our meetings with businesses in the past year, which we think suggests a reversal of a decade-long trend. 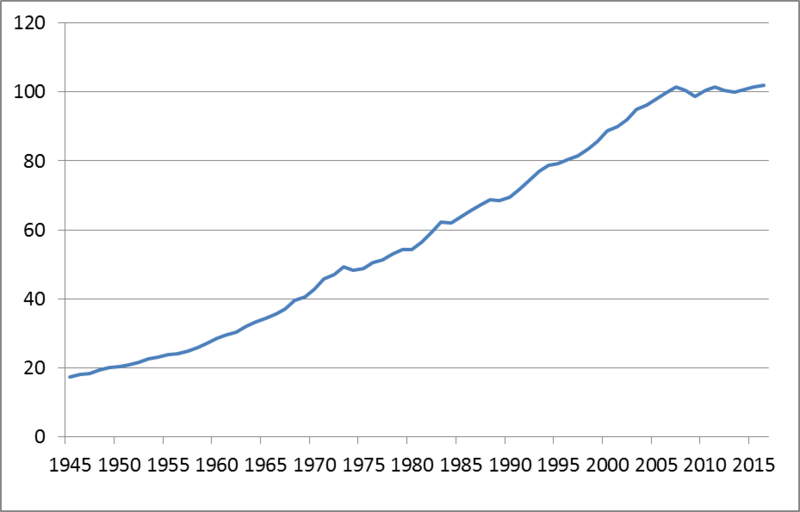 The slowdown in productivity growth since the global financial crisis – both in the UK (Chart 1) and elsewhere – is a much-discussed subject, including at Bank Underground on the historical context, the nature of the productivity puzzle, and human distraction as one possible explanation. There is no consensus as to the precise causes of the slowdown, nor if (and when) it might unwind. In its latest Inflation Report, the Monetary Policy Committee forecasts productivity growth to be a little faster than its average in recent years, as increases in investment begin to feed through, but still only half the rate seen before the financial crisis. In this post we describe how our business intelligence suggests a recovery in productivity growth in the next few years. Until recently, a common thread running through the Agents’ intelligence gathering in the post-crisis period had been that, when looking to expand their productive resources, companies chose recruitment over business investment. This included both ‘direct’ (e.g. shopfloor) and ‘indirect’ (sales, marketing, R&D) employees. In part that reflected a change in the relative costs of labour and capital. Strong growth of labour availability was associated with low real wages growth. Many of our contacts recruited additional staff, sometimes to handle sales growth but often to improve non-price competitiveness – for example to raise levels of service and marketing. Low real wages growth made these actions affordable, with only a limited impact on profit margins. So raising labour productivity was not always a key performance indicator for our contacts – although many believed that the extra resources would ultimately lead to, or be justified by, higher sales revenues. Less sought-after jobs have relied heavily on migrant workers, such as in logistics, hospitality, warehousing, agriculture and food (as documented by Stephen Clarke here– table 1). Our contacts indicate that some recruitment difficulties are now emerging in these areas (See for example the Employment and pay section of the Agents’ summary of business conditions, 2018 Q1). Greater scarcity is adding to pay pressure, as reported in the Agents’ latest pay survey. When expanding output, companies typically assess the relative costs and returns from recruiting additional labour and/or investing in new plant and machinery. Larger companies formally estimate the payback period for a major capital project, in terms of how long it takes to recover the costs of the project from enhanced earnings. Often the benefits from investment in new plant and machinery include a reduction in the need for labour. Higher labour costs shorten the payback period and incentivise such investment. The Bank’s Agents’ recent experience is that, increasingly, the focus of many companies is turning to investment in labour-saving plant and machinery to raise productivity and alleviate resource bottlenecks. This recent pivot towards business investment to overcome greater labour scarcity is being aided by some major advances in technology, which are increasing the returns from investment relative to those from recruitment. Robotic technologies in particular are being deployed in a mix of manufacturing and service industries, at relatively low cost and often with payback periods of less than five years. Usually, the working life of the equipment being deployed is greater than five years, making the investment extremely attractive. Research from the International Federation of Robotics indicates that the UK has lagged well behind other developed economies in adopting robotics in the industrial sector over the past decade or so. Discussions with some of our multi-national contacts which have automated factories in Europe, but not in the UK, indicate this at least partly reflects higher relative unit labour costs on the continent. Hence, the payback period associated with automation of European factories has been comparatively favourable. But with the gap in relative labour costs starting to close, some of those contacts are now actively looking to deploy the same technologies in the UK as they do overseas. We have found many examples of business investment in automation technologies, spanning a variety of industries and services, involving investment in both physical equipment and IT software. The use of robots is growing amongst our packaging industry and meat processing contacts. In the services sector, large and medium-sized chains of retailers are accelerating the roll-out of self-service till points. Retailers and logistics firms are increasingly investing in warehousing automation that can raise productivity substantially. Hotel and airline groups are introducing online check-in facilities, while the former are starting to offer a range of service levels in cleaning and catering so as to provide customers only with the services they genuinely value. 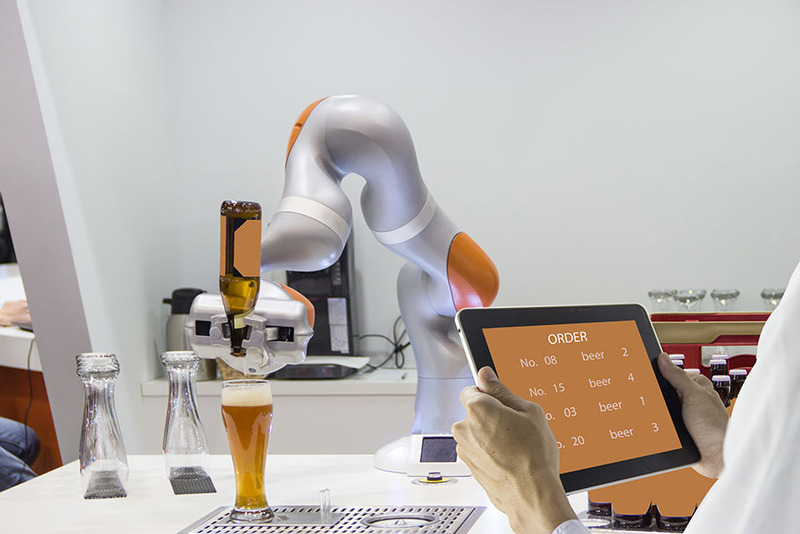 Looking into the future, restaurant and bar staff may be gradually replaced through automation and self-service beer pumps. And among higher value-added industries such as accounting, cloud-based IT is being used to automate administrative processes (for example invoice-handling), thereby reducing the need for support staff. Further transformational changes in technology may automate myriad processes which currently rely in part on human labour – an example being the use of artificial intelligence to assist institutional investors. In closing, it is important to note that, while greater automation should improve the productivity and cost competitiveness of the industries so affected, the impact on measured productivity of the whole economy may be somewhat less apparent, at least initially. That is because those employees displaced by automation might be forced into less productive and less well-paid work. So there could be an adverse mix effect on measured UK productivity in the short term. We detect a change in the mindset of business leaders recently, in favour of capital over labour. The fact that examples are becoming more common across sectors suggests that the recent slowdown of labour supply growth may be followed by a sustained productivity recovery. Many of the technologies being implemented have been available for some time, but a reduction in the availability of labour is acting as a catalyst for their introduction. We suspect the recovery in productivity may be gradual at first, as planned investment takes time to complete and then bear fruit. However, the frequency of cases where contacts are looking to address rising costs and poor productivity suggests to us that whole-economy productivity growth should soon start to recover. Will Holman and Tim Pike both work in the Bank’s Agency Division. Next Post Pumping Iron: How can metals prices help predict global growth? Very interesting post and an important turn-around, if it’s true. Do you think labour supply is the principal factor here? Have other factors come into play. One comment I heard recently was “Why would you invest in business when housing returns 8%”. The implication being that the high returns on assets were dwarfing returns from capital investment.